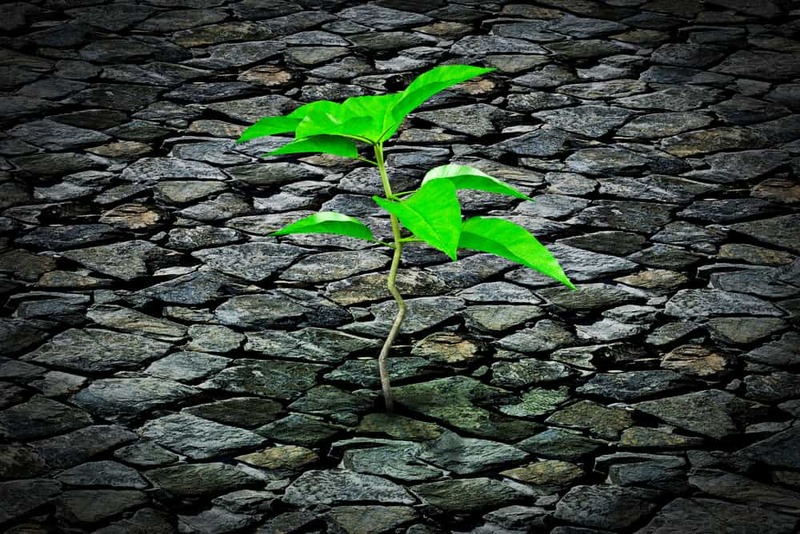 Resilience is now recognised as a very important competence to demonstrate in the workplace. In the increasingly complex context of today’s working environment, the resilience of individuals, and organisations becomes critical for business success. Therefore, these developing resilience training course materials are suitable for all employees. Resilience is the ability to cope with the challenges, problems and set-backs we face in life, and to become stronger because of them. It relies on different skills and draws on various sources of help, including rational thinking skills, physical and emotional health, and an individuals relationship with those around them. Why is running this Developing Resilience training course a good idea? Understand the importance of personal resilience and having a positive focus at work. Adapt their approach to work and become more optimistic. Overcome negative thinking to help ensure business success. Use tools to effectively build their personal resilience. Develop key tactics to help ensure organisational resilience. Use emotional intelligence techniques to help improve workplace communication. Ultimately, these training course materials will help employees to focus on the positive aspects of their role and to engage with workplace activities with an optimistic and enthusiastic mindset. Developing resilience means overcoming and developing from workplace setbacks. It allows an individual to focus on their own wellbeing by taking a positive mindset and avoiding getting overwhelmed by issues when they arise. The aim is to be able to bounce back from adversity and accept the challenges that the workplace can bring. We all have the ability to develop personal resilience and these training course materials aim to help participants tap into the skills required. Introduction and Objectives – Setting the scene while establishing what is meant by workplace resilience. Identifying the expectations and goals that the participants have for the training. 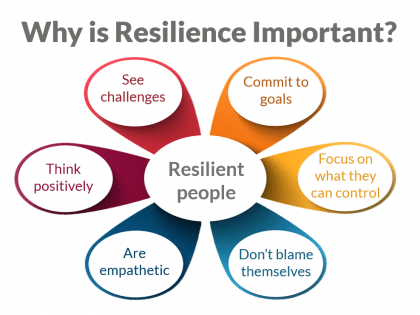 Why is Resilience Important? 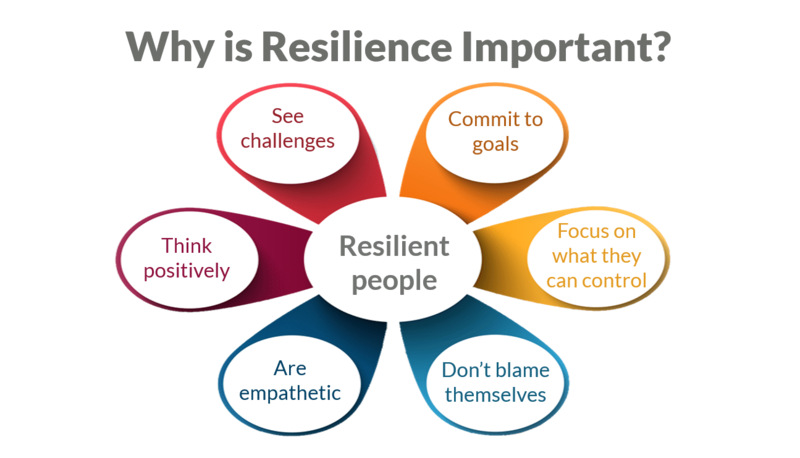 – Exploring why resilience is important to us as individuals and the attributes of resilient people. Identifying the participants own resilience levels and how they currently cope with workplace challenges. Positive Vs. 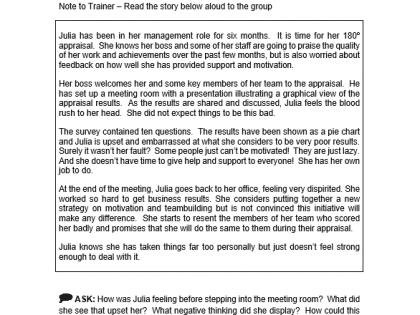 Negative Thinking – Reviewing a case study that explores how negative thinking can impact on how a negative reaction to a minor setback could escalate negative feelings and affect how work is approached. 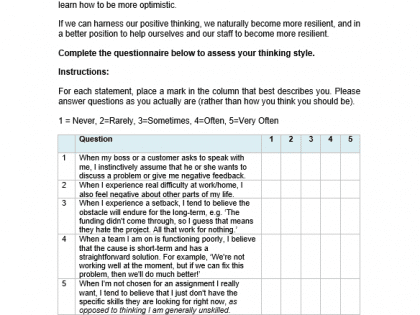 Completing a questionnaire to establish what type of thinker the participant is. The Three Dimensions – Understanding; Permanence, Pervasiveness and Personalisation and the individual’s ability to ‘bounce-back’. 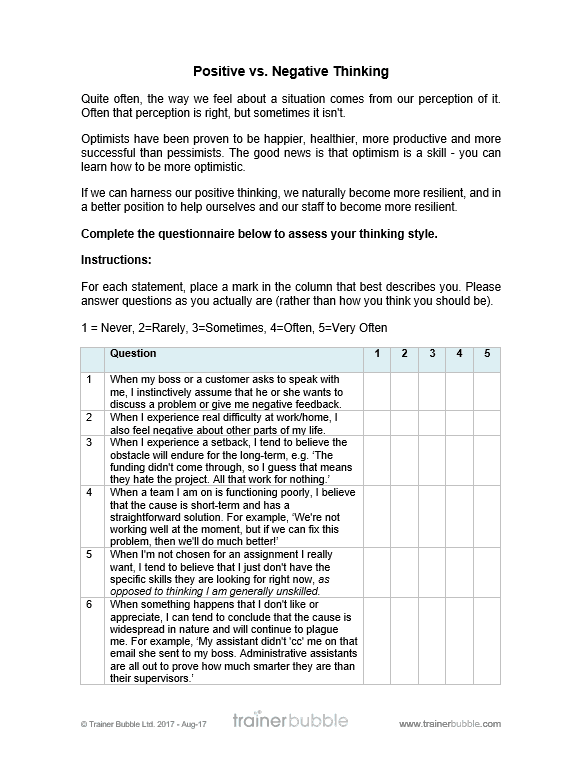 This links back to the previous questionnaire and poses several questions that help the participant to focus on areas of improvement for the future. Overcoming Negative Thinking – The ABC Technique – Looking at; Adversity, Beliefs and Consequences and how understanding this process can help someone overcome negativity. Introducing an exercise that encourages participants to turn negative thoughts into positives. 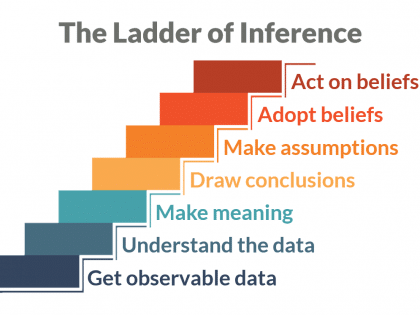 The Ladder of Inference – This model identifies our natural tendency to react to situations based on our past experiences and beliefs. 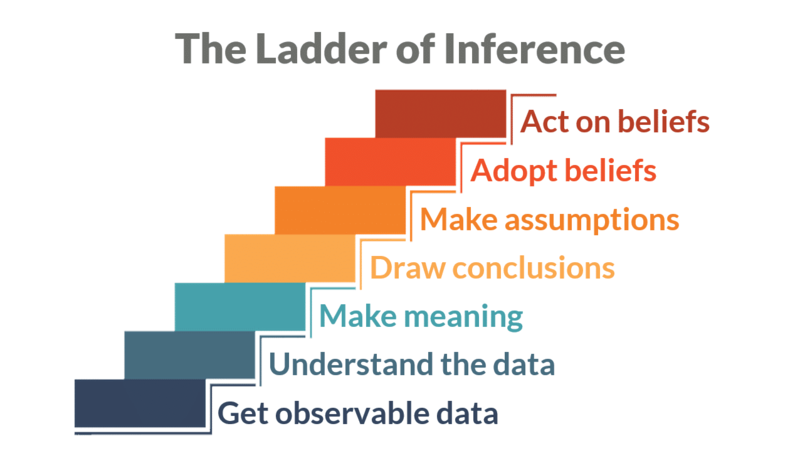 So, here participants are encouraged to use this model to focus on the facts of a situation and avoid adding their own interpretation. Includes the chance to both explore the approach and identify with personal experiences. Locus of Control – This model explores the idea that individuals perceive issues either from an internal or external perspective (thinks happen to them, or because of them). The model is introduced and participants explore an exercise that identifies their own outlook and the effect this might have on them. Includes tips on being more internally driven. 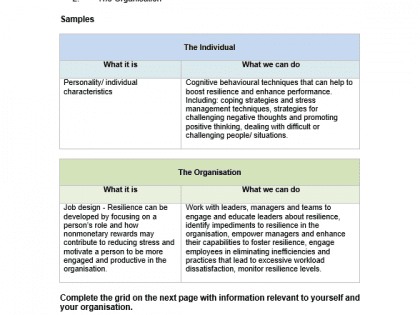 Levels of Resilience – Exploring the relationship between individual and organisational resilience and where there might be some crossover. 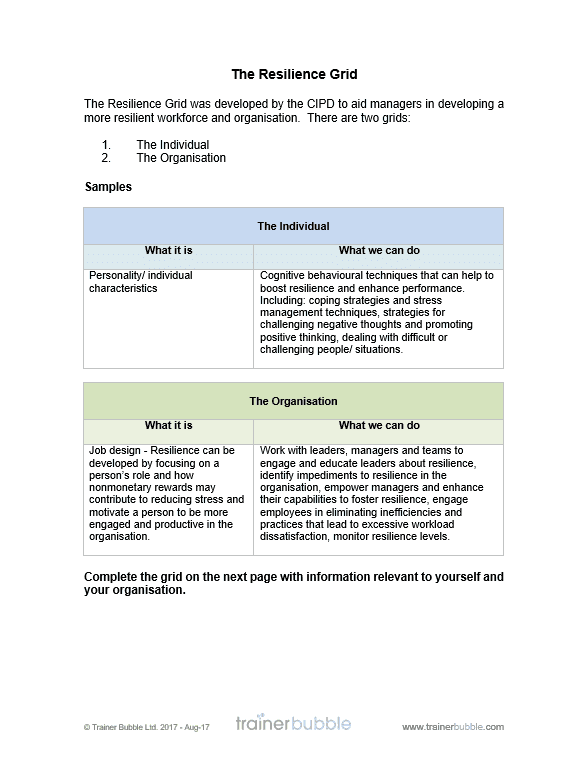 The Resilience Grid – Several examples of the resilience grid for individuals and organisations and the chance to complete a grid to define what they can do to improve resilience in both areas. Developing Emotional Intelligence – A look at some of the key areas of emotional intelligence that can gain ‘quick wins’ for personal communication and resilient behaviour. In-depth exploration of five key skills of emotional intelligence that can improve personal performance. Helping Others to Become Resilient – An activity that explores the opportunities to help and encourage others to increase their personal resilience.